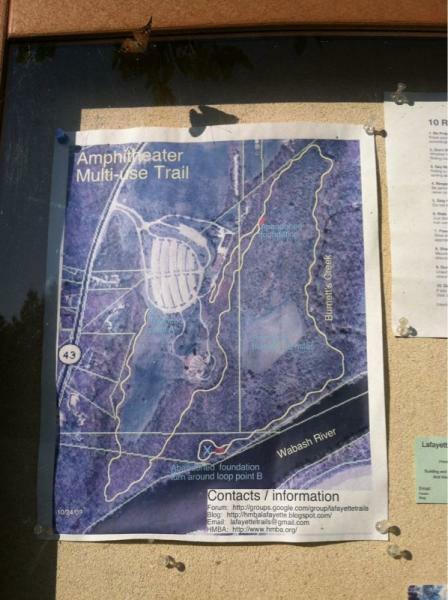 This is a good beginners trail. It is fairly flat, has some small inclines. Nice for people who are just starting to mountain bike. It is an out and back but they hope to eventually make it a true loop. It runs along the Wabash River and Burnett's Creak. Review: This one is definitely for the beginner mountain biker. This is about as flat and smooth as a trail can get. Even with the wabash river at flood stage and receiving over 1" of rain the night before the trails were not muddy. Glad to be able to ride the trail that day. Review: I've been riding in Utah for the past few years. This trail was fun but not too challenging. Not out and back. It is a loop now. Review: Short winding out and back beginner's trail running along the banks of the Wabash river. A few nice views of the river along the way. Review: Sweet trail. 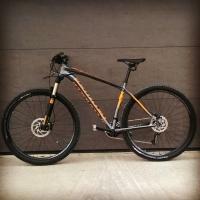 Fun for the advanced ride and great for those new to MTB with good bike handling skills. Giant tree blocking the path near the turn-around from a recent storm. If you run into it just backtrack and take the first exit off the trail to get around it. Review: Great trail to get in shape for beginner. 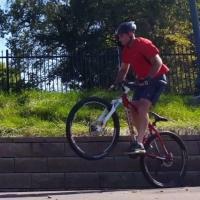 It's been a few years since riding, provides technical practice. Plus it's cline to home! Review: Great beginner trail. Took my son on his first trail ride and had a great experience. People were very friendly. Review: Fun beginners trail. Like someone said before I don't like that it's a "two-way" trail, just makes me nervous since we saw a mother with 4 small children walking the trail. My wife and I had a great time though. Perfect area around to throw a Frisbee and have a picnic and relax. We went on a perfect weather Sunday and there were maybe 8 people total here. We were the only ones on bikes. Review: I nice beginner trail with few technical aspects. Not a fan of the in-and-out format, but it works alright on this trail. There are a couple of splits that can get confusing and you can easily end up doing circles or popping out somewhere completely different than the start. 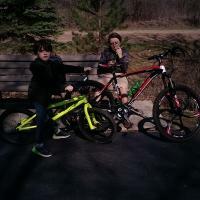 Review: This trail isn't really worth a long drive, however, if you are traveling along I-65 it's a good trail to hop off and onto I-43 and ride to get a break from driving. The trail is fast, fun, and easy. Only a few rocks and one or two roots- nothing too technical at all. At some parts the trail splits; this is how I ended up coming out at the back of the parking lot and therefore discovered there are two entrances. It's mostly an out and back trail- the downside to that is there was one other guy riding the trail along with me and we kept running into each other going opposite directions. Amphitheater Park MTB Trail 3.64 out of 5 based on 15 ratings. 15 user reviews.